I'd like to take this moment to welcome you all to 2013 and wish you all the best in the upcoming year. This holiday season, I stayed close to home, somewhat enjoying the Florida weather, while my family and friends dealt with a dusting to 6" of snow. While I continue to dream of a 'White Christmas,' I do not dream about shoveling it... or measuring it. The weather was nice enough that I was able take my family out on the 30th and snuck down to Miramar Beach for a couple of quick pictures. I can't wait for the weather to be warm enough to actually get in the water. 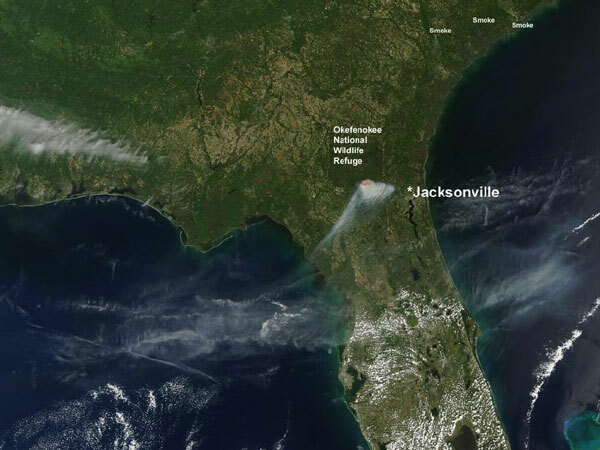 January marks the start of the Wildfire Season in Florida, which typically runs until July. Though wildfires can occur during any time of the year, this seven-month period is when we usually see the height of wildfire activity. Last year, the Forest Service battled over 2,900 individual fires that burned more than 119,000 acres across the state. Weather plays an important role in the way wildfires react. Winds, high temperatures, low humidity, and lack of rainfall make it easy for a wildfire to spread rather quickly once started. So far, things have been fairly dry across the state, after an extremely wet summer that helped wipe out drought across the entire state. 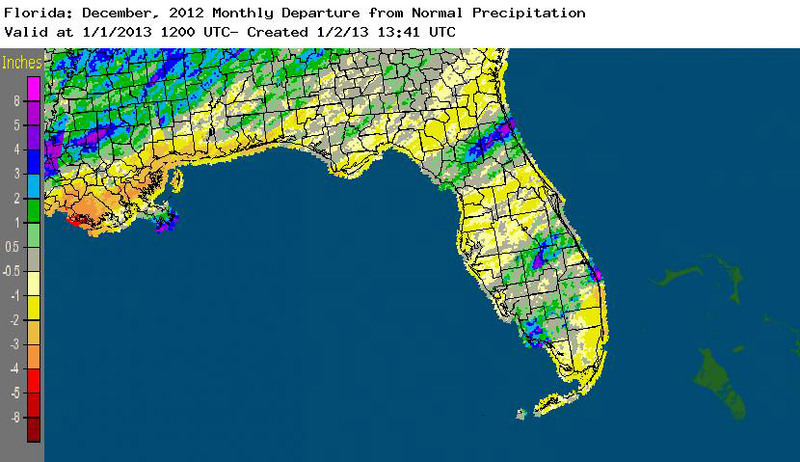 Since the beginning of October, drought has slowly crept its way back into Florida and has started to expand. Reporting drought is the flip side of reporting rainfall, and, in some ways, it's a lot easier. All you have to do is report your 0.00" on those days without rain. It's as simple as quickly logging in, changing the time of observation (if necessary) and hitting the submit button on your form, since the field for rainfall defaults to 0.00". Please help us track the dry areas across the state, so those foresters using the data can have a better idea of where wildfire potential is the greatest. County line fire in Florida. April 10, 2012. Credit: NASA. While most of the state recorded below normal rainfall totals for the month (Table 1), some small portions of the state actually had above normal precipitation in December (Figure 1). Coastal portions of Collier County, along with Palm Beach and Martin counties, areas around the northern shore of Lake Okeechobee, and a line from Gainesville to St. Augustine recorded monthly rainfall totals that were more than 2" above normal. However, most of the state saw between 1" and 2" below normal, and December 2012 was the 10th driest December on record in Pensacola. Multiple flooding reports were made on the 11th in the Jupiter, FL, area after unofficial rainfall totals measured 3-10" in portions of Palm Beach County. Table 1: December precipitation totals and departures from normal (inches) for select cities. Table 2. 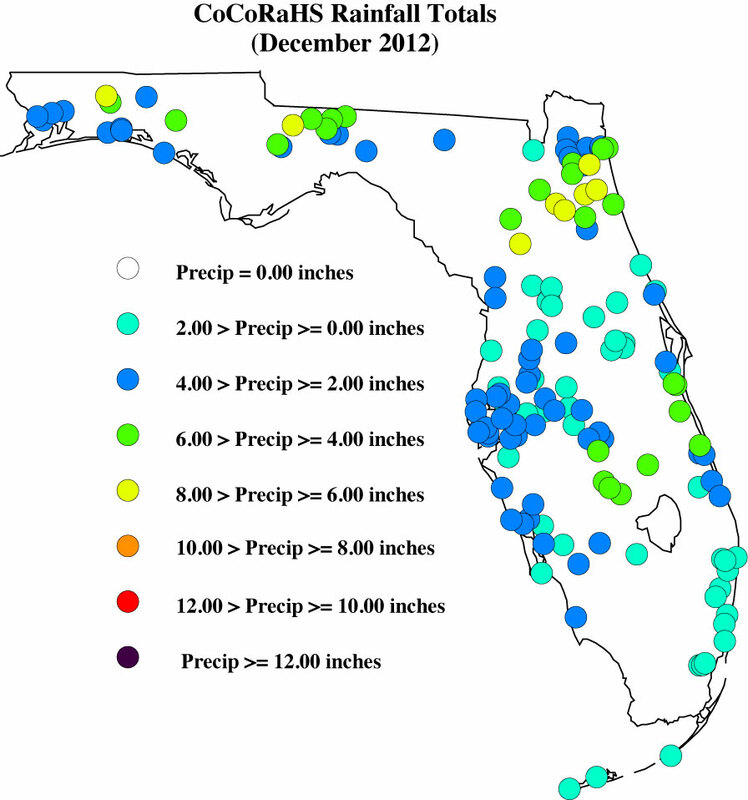 Select daily rainfall records (inches) broken during December (compiled from NOAA, NWS). As the dry conditions continued from November, the authors of the National Drought Monitor expanded some of the dry conditions in north Florida by the beginning of the month, to include most of the southwest coast of the state and portions of north central Florida. Mid-December, the dry conditions had been removed from Charlotte, Collier, Glades, Hendry, and Lee counties, though the dryness was kept in Monroe County. 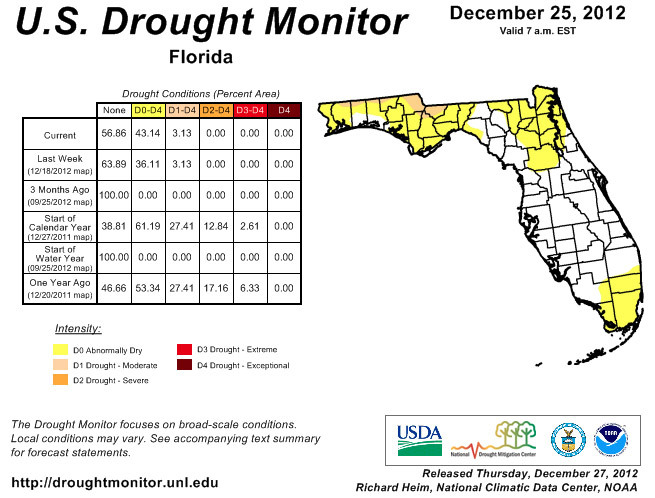 The moderate drought conditions along the Florida/Alabama and Florida/Georgia line persisted through the end of the month, while Dade and Broward counties are now reporting dry conditions. 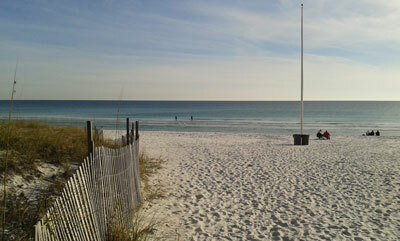 A few reports in Florida were flagged and required some additional information during December. I appreciate how understanding the contacted observers were, along with how quick they were to reply to my emails, though there are a few outstanding issues that need to be resolved. Please remember: if you receive an email from me with the subject line 'Question About Your Recent CoCoRaHS Observation', please take a moment to answer me back. And if you have any questions, please feel free to contact me. You can now 'Like' Florida CoCoRaHS on Facebook! By joining our Facebook page, the latest Florida CoCoRaHS news items will automatically show up in your "news feed" when you first login to Facebook. To join, go to the Florida CoCoRaHS Facebook page, then click the "like" button on our Facebook page. Make sure to also check out the CoCoRaHS Headquarters Facebook page that is updated frequently with news stories, information on webinars, pictures and more!